Every fall I try to think of fun and different Apple recipes to take advantage this awesome autumn fruit with its growing number of varieties. My grandmother has many tasty Apple dessert recipes in “The Art of Fine Baking.” I’ve been baking my way through them and posting those such as Apple Cheesecake Puff and Sauteed Apple Cake on this site. The majority of these Apple recipes are more refined desserts, fit for a crowd or dinner party. I often crave something easier, something that takes the idea of Apple pie but simplifies, making it guilt-free in the process. Well maybe not entirely guilt-free, but at least more so than a traditional Apple pie or the over-the-top (but awesomely delicious) Stuffed Baked Apples with Homemade Caramel Sauce I made last year. 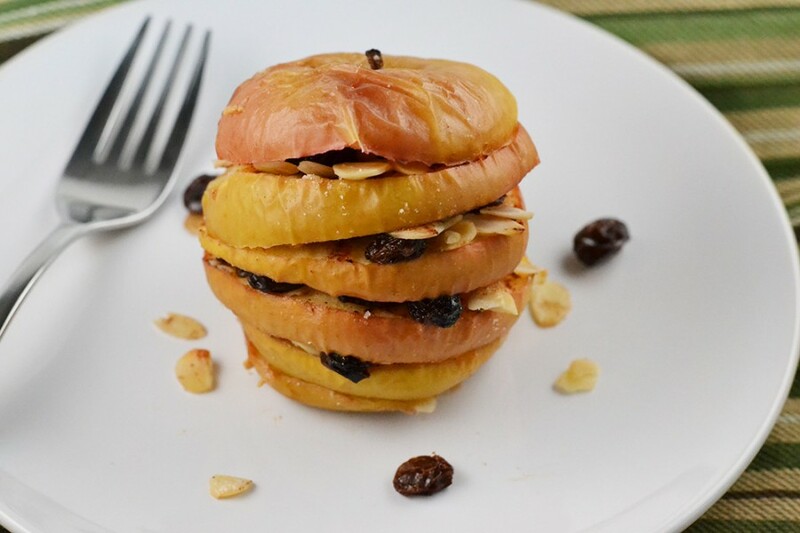 These sweet cinnamon baked apple snack stacks are the perfect compromise. Basic cored baked apples, such as the recipe from The James Beard Cookbook, by the legendary James Beard are tasty in their own right. But I prefer to evenly distribute the cinnamon sugar amongst the slices so that the familiar sweet earthy fall flavors can be enjoyed in every bite. The additional components of each sliced apple layer are really up to you. I couldn’t make up my mind on which I liked better: plump juicy raisins with the light crunch of blanched almonds (pictured) or creamy peanut butter – a classic snack combo. So I decided to include both in the recipe below. The steps couldn’t be easier: slice the apple in rounds, remove some of the tough core, sprinkle cinnamon sugar, raisins, nuts or layer of your choice, and bake. Not only are these quick to make, they are healthier than apple pie and make a fun after school snack for the kids (the nuts and peanut butter add some protein) or even a dessert to finish those weeknight meals with a bit more fall flare. Slice apples in 1/4 inch rounds. Rub slices with lemon to prevent browning. Using a paring knife, cut the core out of center slices of the apple, leaving the rounds intact. Sprinkle each slice/round with cinnamon sugar on both sides. If using almonds or walnuts, sprinkle nuts and raisins on the bottom slice of each apple. Sandwich with the next consecutive slice/round. 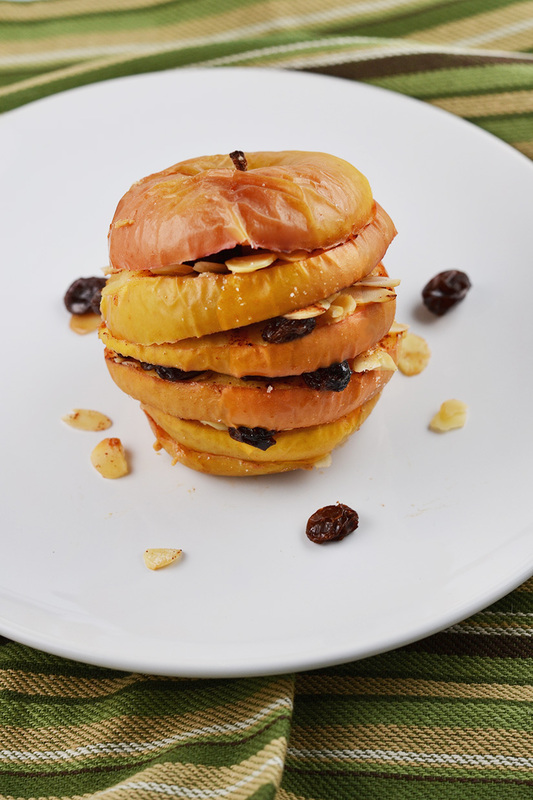 Continue sandwiching nuts and raisins until all slices are used and apple is whole. If using peanut butter, follow instructions for nuts but instead spread 1 tablespoon peanut butter on the rounds/slices, alternating layers. Stick toothpicks in the top to secure and ensure apple slices don’t slide apart while baking (if toothpicks are unavailable and slices do slide apart, they can simply be re-stacked once cooled). Bake 35-40 minutes or until apples are soft but firm and can easily be pierced with a fork.